1University of Warmia and Mazury in Olsztyn, Chair of Agricultural Chemistry and Environmental Protection, ul. Oczapowskiego 8, 10718 Olsztyn, Poland. *Corresponding author (marta.zalewska@uwm.edu.pl). Phytoextraction relies on plants with a high capacity to absorb heavy metals and remove them from the soil. The objective of this study was to analyze the potential of sunflower (Helianthus annuus L.) and white mustard (Sinapis alba L.) for phytoextraction of Zn-contaminated soil. Research was based on a strict pot experiment conducted in a greenhouse. Seven treatments were established with increasing Zn concentrations: 0, 25, 50, 100, 200, 400, and 600 mg Zn kg-1 air-dry soil. The first tested plant was fodder sunflower. In the following year, white mustard was sown in the same pots. Plants were harvested at the end of the flowering stage. The toxic effect of Zn on sunflower yields occurred at the contamination level of 200 mg Zn kg-1 soil. In the second year of the experiment, a significant decrease in mustard biomass took place in response to 400 mg Zn kg-1 soil. The contamination level of 600 mg Zn kg-1 soil resulted in complete plant death. Plant growth was not inhibited even at high tissue Zn concentrations of 515 mg Zn kg-1 sunflower DM and 422 mg Zn kg-1 mustard DM. The 2-yr cropping system did not contribute to a significant decrease in soil Zn content. Despite high concentrations of Zn in sunflower and mustard plants, total Zn uptake accounted for only 1% to 8% of the Zn rate introduced into the soil. However, in the long run, the growing of crops could reduce Zn contamination levels in the soil. The relatively high tolerance of sunflower and white mustard for Zn contamination and rapid growth of these species are possible alternatives for phytoextraction and phytostabilization of Zn-contaminated soil. Key words: Helianthus annuus, Sinapis alba, zinc accumulation, zinc toxicity, soil contamination. In Poland, the percentage of Zn-contaminated soils is relatively high compared with soils polluted with other heavy metals and is estimated at 11% (Terelak et al., 1997; 2002). Zinc is characterized by high mobility in soil and is accumulated in large quantities by plants, and thus poses a serious environmental threat (Vanek et al., 2005; Zalewska, 2012). Chaney (1983) was the original author of phytoremediation techniques for soils contaminated by heavy metals. The initial concept was based on hyperaccumulator species that are capable of absorbing large quantities of heavy metals and are resistant to high metal concentrations in the soil. The scope of research in phytoremediation has been considerably extended, and now also covers mechanisms responsible for uptake and translocation of trace elements (Krämer et al., 1996; Lasat et al., 1998; Salt et al., 1999). Attempts are being made to explain increased tolerance to high concentrations of heavy metals of various plant species. Plants are also genetically modified to enhance their phytoremediation potential (Karenlampi et al., 2000; Clemens et al., 2002; Pavlíková et al., 2004; Krämer, 2005). Another line of research concerns using selected crop plants in the phytoextraction process. Heavy metal concentrations in their tissues are not as high as in hyperaccumulators, but crop plants are capable of producing very large quantities of biomass even in highly polluted soils, which increases the effectiveness of purification. The efficiency of phytoextraction can be improved by adding various chemical compounds to the contaminated substrate, which increase solubility and uptake of metals by plants (Blaylock et al., 1997; Huang et al., 1997). Phytoextraction is a relatively inexpensive and easy technique compared with chemical methods to remove heavy metals from the soil; however, according to numerous reports, it is characterized by low efficiency (Ernst, 2000; Zalewska, 2012). Management of biomass containing large amounts of toxic metals also poses a problem (Ernst, 2000; Sas-Nowosielska et al., 2004). After phytoextraction, heavy metals can partially remain in the soil in plant roots that contain much higher levels of heavy metals than harvested above-ground plant parts. The aim of this study was to analyze the potential of two crop plants, silage sunflower and white mustard, for phytoextraction of soil with various levels of Zn contamination. A pot experiment was conducted in the greenhouse of the University of Warmia and Mazury in Olsztyn. Seven treatments were established with increasing Zn concentrations: control (without Zn), 25, 50, 100, 200, 400, and 600 mg Zn kg air-dry soil. Each treatment was replicated four times. Pots were filled with 8.0 kg of air-dry soil with the granulometric composition of loamy sand, which contained 81.3% sand (fraction 2.0-0.05 mm in diameter), 16.9% silt (fraction 0.05-0.002 mm in diameter), and 1.7% clay (fraction 0.002 mm in diameter) according to the USDA textural soil classification. Concentration of available forms of Zn (extraction in 1 M HCl) was 13.56 mg Zn kg-1 soil, organic C content 8.49 g kg-1 soil, and pH 5.78 in 1 M KCl. The first tested plant was fodder sunflower (Helianthus annuus L., 'LG 53.85'). White mustard (Sinapis alba L., 'Barka') was sown in the same pots the following year. Plants were harvested at the end of the flowering stage. After emergence, six sunflower plants and nine white mustard plants were left in each pot. Soil moisture content was maintained at 60% of maximum water-holding capacity. Before sowing, soil was treated with increasing doses of Zn in the form of ZnSO47H2O. Nitrogen, P, K, and Mg fertilizers were supplied at a constant rate in all treatments. The following were applied to each pot before sowing sunflower: 0.8 g N (as NH4NO3), 0.5 g P (as KH2PO4), 1.2 g K (as KH2PO4 and KCl), and 0.2 g Mg (as MgSO47H2O). Ammonium saltpeter was added during the growing season at 0.7 g N pot-1. An additional 0.8 g N pot-1 (as NH4NO3) and 1.2 g K pot-1 (as KCl) were incorporated into the soil before sowing white mustard in the second year. During the growing season, 0.7 g N pot-1 (as NH4NO3) was added. Dried and ground plant samples were mineralized (separately from each pot) in a mixture of concentrated HNO3, HClO4, and H2SO4 acids at a 40:10:1 ratio. Zinc content in mineralized samples was determined by atomic absorption spectrophotometry (AA-6800 Series Atomic Absorption Spectrophotometer, Shimadzu, Kyoto, Japan). Soil samples were air-dried and passed through a 2-mm sieve. 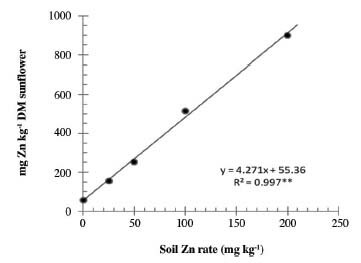 Soil was analyzed before establishing the experimental treatments for available forms of Zn after extraction in 1 M HCl with a 1:10 soil solution ratio (Gembarzewski et al., 1987), pH in 1 M KCl (1:2.5 soil:solution ratio) by the potentiometric method, and organic C content by the method proposed by Kurimies (Walinga et al., 1992). Granulometric composition was determined by laser diffraction (Mastersizer 2000 particle size analyzer, Malvern Instruments Ltd., Malvern, UK) (Buurman et al., 1997). After the mustard harvest, soil samples were collected from each pot and Zn was determined by atomic absorption spectroscopy after extraction in 1 M HCl with a 1:10 soil:solution ratio. Results were processed by ANOVA for a one-factorial pot experiment with a completely randomized orthogonal design. Differences among means (1% level of significance) were tested by Tukey's HSD test with the PC STATISTICA program version 7.0 (StatSoft, Tulsa, Oklahoma, USA). The relationships between selected parameters were determined by correlation and regression analyses. Applying 25, 50, and 100 mg Zn kg-1 soil did not lead to significant differences in sunflower biomass compared with the control treatment with naturally occurring Zn levels (Table 1). Plant yield decreased significantly after applying 200 mg Zn kg-1 soil. In this treatment, sunflower biomass yield was less than half of the amount reported in the control treatment. Rates of 400 and 600 mg Zn kg-1 soil inhibited germination of sunflower seeds and led to complete plant death. In a previous experiment (Zalewska, 2012) investigating perennial ryegrass grown in soil with the granulometric composition of sand, applying 200 and 400 mg Zn kg-1 soil also inhibited seed germination and plant growth and biomass yield of the first regrowth decreased by 31% and 52%, respectively, but complete plant death was not reported. Baran (2013) revealed that maize is less sensitive to Zn-polluted soil. In her research, applying 250 and 750 mg Zn kg-1 soil reduced biomass of above-ground plant parts by 10% and 25%, respectively (Baran, 2011). White mustard was grown in the second year of the study. 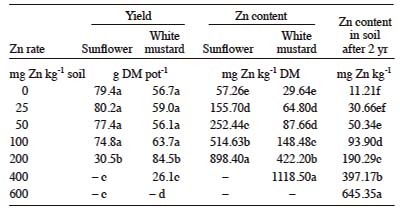 Similar to sunflower treatments, applying 25, 50, and 100 mg Zn kg-1 soil did not produce significant differences in the yield of mustard plants (Table 1). Unlike sunflower treatments, introducing 200 mg Zn kg-1 soil did not inhibit mustard plant growth. The yield of mustard plants in this treatment was even significantly higher compared with other treatments and could be attributed to higher nutrient concentrations (N, K, and P) remaining in the soil after sunflower cultivation and the conversion of Zn into less soluble forms. In the first year of the study, applying 200 mg Zn kg-1 soil led to a significant decrease in sunflower yield, and high quantities of unused N, K, and P could have remained in the soil. Zinc exerted a negative effect on mustard plants beginning at 400 mg Zn kg-1 soil, which reduced biomass yield by 50% compared with the control. Applying 600 mg Zn kg-1 soil completely inhibited white mustard plant growth. Table 1. Effect of Zn-contaminated soil on green mass yield, Zn content in sunflower and white mustard, and Zn content in soil (extraction with 1 M HCl) after harvesting plants. Mean values in the same column followed by different letters indicate significant differences according to Tukey's test (P ≤ 0.01). Applying increasing Zn rates significantly elevated its concentration in sunflower and mustard plants (Table 1). 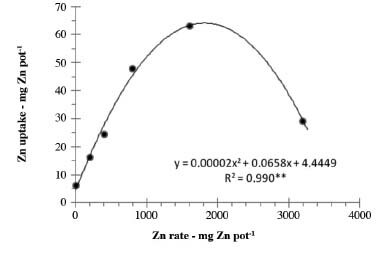 A strong positive correlation was observed between the level of Zn-contaminated soil and Zn concentrations in plants; this was demonstrated by high determination coefficient values (Figures 1 and 2). A similar relationship has also been observed by Cardwell et al. (2002) and Deng et al. (2004) for Zn accumulation by some wetland plants. Zinc easily penetrates plant cells. Applying 200 mg Zn kg-1 soil increased concentrations to 898 mg Zn kg-1 sunflower DM (nearly 16-fold increase compared with control treatment) and 422 mg Zn kg-1 mustard DM (nearly 14-fold increase compared with control treatment). A significant increase in Zn concentrations was also noted in treatments with low levels of the analyzed metal (25 and 50 mg Zn kg-1 soil), particularly in sunflower plants. 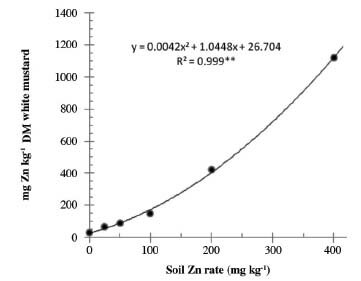 The ease of Zn penetration into plant cells poses a significant threat to agriculture 1ven in soils with low levels of the examined heavy metal. Figure 1. Relationship between the level of Zn-contaminated soil and Zn concentration in sunflower. **Correlation is significant at 0.01 level. Figure 2. Relationship between the level of Zn-contaminated soil and Zn concentration in white mustard. Concentrations of 20 to 80 mg Zn kg-1 DM in plants are sufficient to meet crop plant requirements. A very high increase in Zn concentrations in sunflower and mustard plants, which was proportional to the soil contamination level, suggests that the analyzed metal easily penetrates the cell wall and plasma membranes of root cells. Zinc is easily absorbed by plants because it is one of the most mobile soil elements. According to Chaney (1993), toxic effects of Zn are most often manifested on leaves at concentrations higher than 300 mg Zn kg-1 DM; in highly-sensitive plants, symptoms of toxicity can be observed at concentrations below 100 mg Zn kg-1 leaf DM (Marschner 1995). In the current experiment, toxic effects of Zn were not observed even at concentrations of 515 mg Zn kg-1 sunflower DM and 422 mg Zn kg-1 mustard DM; this suggests that the analyzed plants are highly resistant to high tissue Zn levels. The growth and development of sunflower and white mustard plants were not inhibited when tissue Zn concentrations exceeded 5-fold optimal levels. Results of a previous study of perennial ryegrass validate the above observation (Zalewska, 2012). The cited study also demonstrated that toxic effects of Zn on plants are determined by soil cation exchange capacity. A higher soil mineral and organic colloid content has protective effects; it significantly reduces concentrations of active forms of Zn in soil, thus minimizing Zn toxicity. In the present study, Zn concentrations were 2- to 3.5-fold higher in sunflower plants than in white mustard plants at corresponding levels of Zn pollution. This difference could be attributed to a drop in the concentrations of readily soluble forms of Zn in the soil during the experiment that limited the transfer of Zn to mustard plants. Zinc uptake by sunflower plants increased proportionally with a rise in soil contamination levels from 25 to 100 mg Zn kg-1 soil (Table 2). A reduction in biomass yield after applying 200 mg Zn kg-1 soil led to a decrease in Zn uptake by sunflower plants. A similar dependency was observed in mustard plants, but Zn uptake was considerably reduced only in treatments containing 400 mg Zn kg-1 soil due to a significant decrease in mustard biomass (Table 2). The coefficient of determination illustrating the correlation between total Zn uptake by sunflower and white mustard plants and the level of Zn-contaminated soil reached a very high value of R2 = 0.99 (Figure 3). Total Zn uptake by sunflower and mustard plants accounted for only 1% to 8% of the Zn rate incorporated into the soil. Despite high concentrations of Zn in plant tissues, soil post-harvest content did not decrease significantly at the end of the 2-yr experiment (Table 1). In a study by Gworek et al. (2003), who analyzed phytoremediation efficiency in soils contaminated with heavy metals, Zn uptake by harvested plants did not exceed 2.5% of the mobile Zn fraction. Similar Zn uptake levels were reported by Antonkiewicz and Jasiewicz (2003) in a study of maize. The low efficiency of phytoremediation techniques could also be attributed to the fact that analyzed samples of post-harvest soil contained small root fragments that are characterized by substantially higher concentrations of heavy metals than above-ground plant parts (Deng et al., 2004; Zalewska, 2010). This undoubtedly influences Zn soil concentrations after harvest. Table 2. Effect of Zn-contaminated soil on Zn uptake by sunflower and white mustard. Figure 3. Relationship between the level of Zn-contaminated soil and total Zn uptake by sunflower and white mustard. Sunflower and white mustard can accumulate large amounts of Zn and are relatively resistant to high Zn soil concentrations; therefore, they can be used for Zn phytoextraction of moderately contaminated soil (approximately 200 mg Zn kg-1 soil). Cultivation of the test plants allowed removal of approximately 20 kg Zn ha-1 contaminated soil. In the short term, tested crops would not effectively remove Zn from the soil. However, in the long run, the growing of crops could reduce Zn contamination levels in the soil. Moreover, relatively high tolerance of sunflower and white mustard to Zn contamination and the rapid growth of these species are possible alternatives for phytostabilization of Zn-contaminated soil.